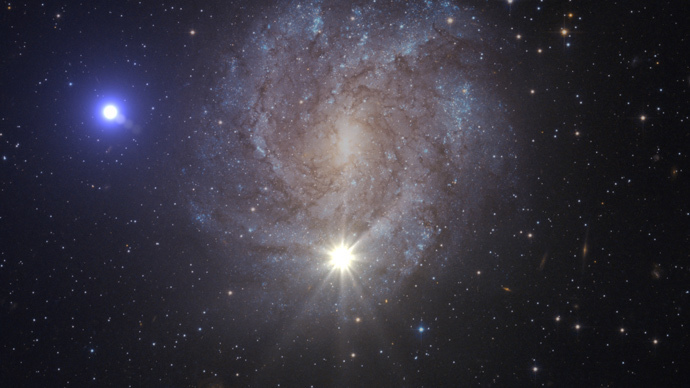 A hypervelocity star traveling at a speed of 1,200 kilometers per second is heading away from the Milky Way galaxy, boosted by its sibling star’s death as a massive supernova. The star, known as US 708, was first discovered in 2005 and is supposed to be the remnant of a red giant. Now, scientists at the European Southern Observatory in Garching, Germany, have measured its full 3D speed, relative to the center of the galaxy, with the help of the data of the Keck Observatory on Mauna Kea in Hawaii – and it turns out to be breathtaking: 1,200 kilometers a second or 2.7 million miles per hour, W. M. Keck Observatory reported on Thursday. “At that speed, you could travel from Earth to the moon in five minutes,” one astronomer at the University of Hawaii Eugene Magnier said in a press-release. The scientists also found out that the star was spinning quickly, at over 100 kilometers per second, which means that in the past it has received an energetic boost. What is also odd about the star is that it has lost its hydrogen, so common explanations suitable for any other previously discovered hypervelocity stars, do not apply. Hypervelocity stars are those traveling fast enough to escape the gravitational pull of its galaxy. Usually, the stars that are going fast enough to escape the gravitational grasp of our galaxy resemble the sun and are slower than US 708. They are thought to have once had pairs. However, when one star is sucked in by the supermassive black hole at the center of the Milky Way, the other one gets released from the grip of the whole galaxy. However, astronomers believe that US 708 was in a very close relationship with another star – so close, in fact, that even a black hole couldn't tear them apart. The current theory suggests that the star’s pair was a white dwarf that might have stolen all its hydrogen, passed on to the partner’s helium core – until the fatal destabilization that caused ignition, turning it into a massive supernova. Now, astronomers, who have published their findings in the Friday issue of journal Science, hope to find more stars like US 708 to study supernovas of this type. They are called “standard candles”, and help measure distances in the universe. “If we can really prove this scenario, then we have a means to study those explosions in a new and very interesting way,” said Geier.